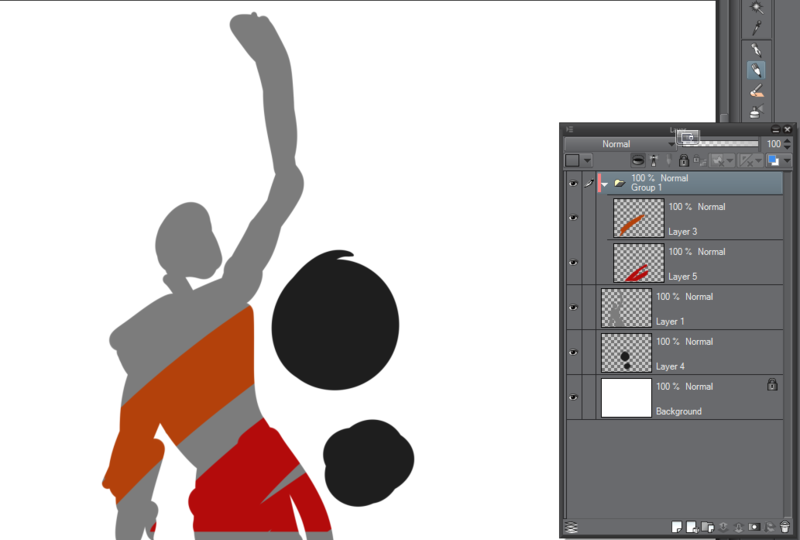 There was a request that became a feature to be able to use a layer group as the base of a clipping group, (http://feedback.photoshop.com/photosh... ) but I was facing the opposite need yesterday: be able to group layers that are being clipped in a clipping mask. I’d love to be able to clip a group to a layer. Layer nesting indentation is getting very confusing though! I bet we could make some documents that would trip up other designers who weren’t paying close attention. I'm not 100% sure I understand PECourjoie's use case, but could you not have grouped all those layers together, and then added your clipping mask to the group as a whole? This works in CS6 and CC, but not in versions older than CS5 if I recall. 1. 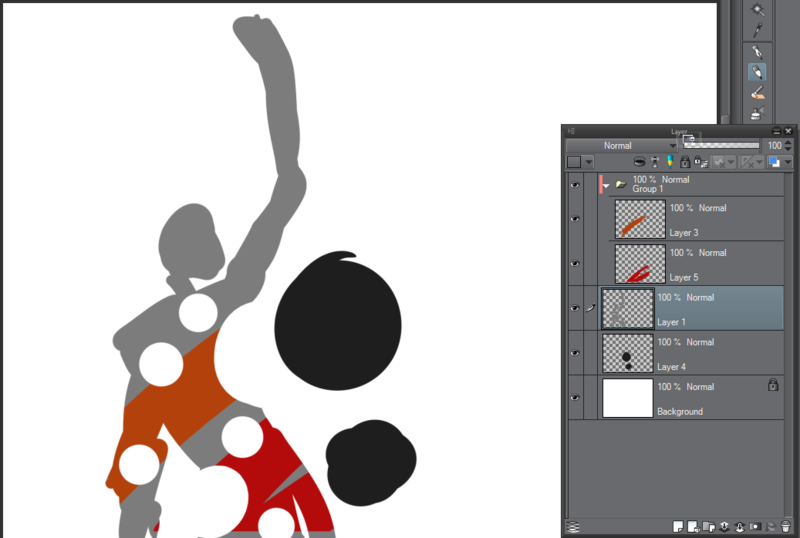 Take all your layers that are clipped plus the base layer that they're clipped to and throw them in a group (CTRL-G). 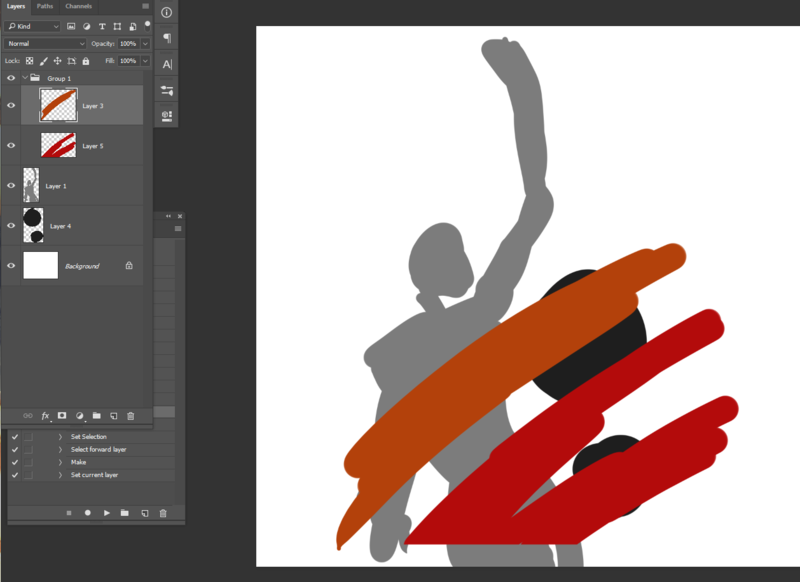 Now, drag the mask / shape of the base layer and make it the clipping mask for the entire group. As of CS5 (I think) you can apply layer f/x to the Group itself, so any f/x you had on the base layer might need to be moved to the Group. 2. Take all your layers plus the base layer, and just group them all together (including the base layer). This should not change the clipping or the f/x in any way as far as I can tell. Definitely have had the need for that! Tom, scenario number one is not possible: you cannot put a group inside a clipping mask, hence this very request. Scenario two is not what I'm after. 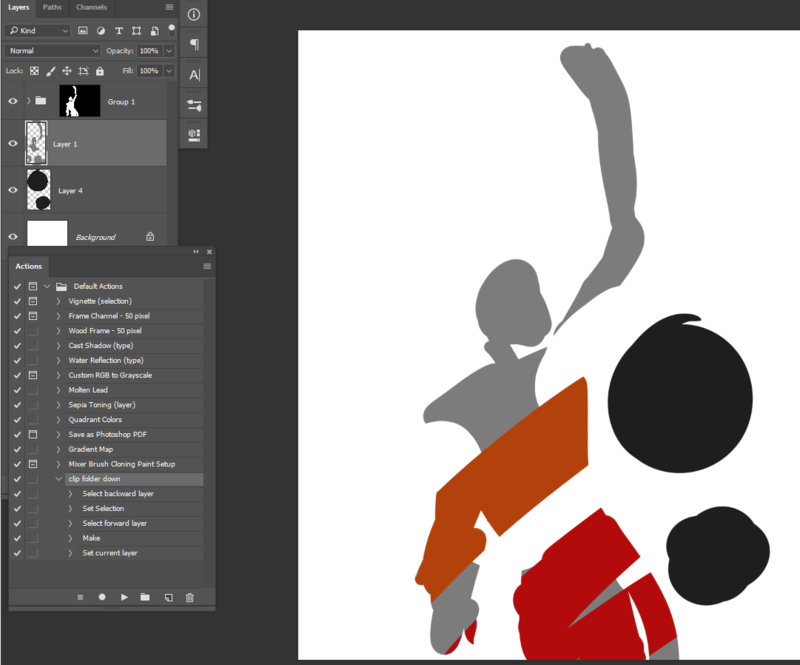 In the attached image, I might want to group together some of the clipped layers. 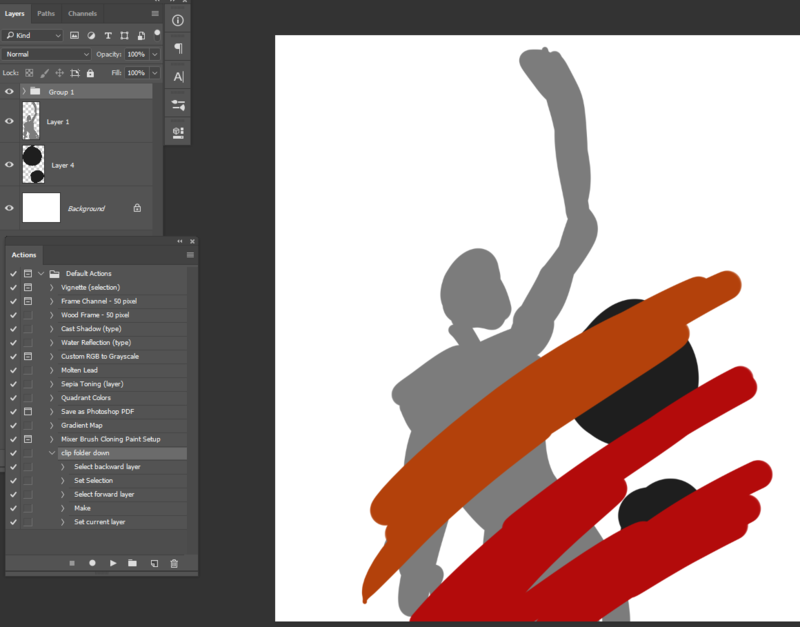 Or I might want to mask the three highlighted layers. 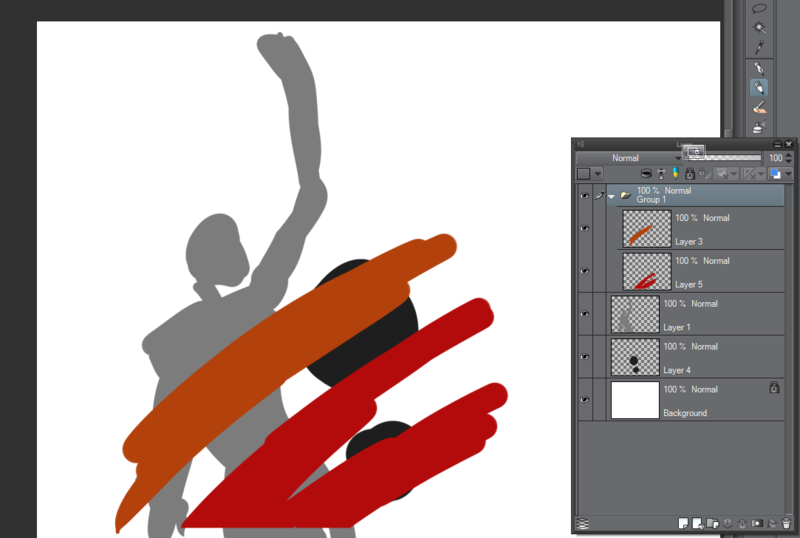 Right now, I would have to mask them three with the same layer mask. Would they be grouped, one mask would let me control them together. Yes, I was suggesting that an option would be to group all 4 items (the curve, the 2 flags AND the ellipse), and then using the shape of the ellipse, set that as the vector mask on the group. But I see that this would be less than optimal in your case because you would like the flexibility of resizing the ellipse or moving it and automatically changing the mask. In your example file here my approach might be to replace Ellipse 1 altogether. In fact, you don't really need it, do you? Instead of an elliptical base layer, use an elliptical vector mask on the group. But I'm sure this is a simplified example. The better example would be some close-cropped Smart Object - say of a person or something complex - that you might want to be able to go back later and re-edit its transparency. In that case, the only real option is to select all 4 layers and just Group them up. This at least cleans up your workspace a little and keeps them organized. This will probably be pretty low on Adobe's list, but I certainly can confirm a use case for letting a Group be clipped by a base layer. Just the other day I was wishing to be able to create nested clipping groups - I wonder whether allowing a group to be clipped would as a secondary benefit, enable a reasonable UI for nested clipping? I know this is a year old, but I also would like to see this happen as well. I also have the same opinion that it's nice that Photoshop does 3D now, but honestly I would rather see better functions for smart objects, masking, and groups. If I want to do 3D I can go to Blender, Maya or Cinema 4D, but if I want to make a seamless background asset for my 3D environment, I need to use Photoshop, and a lack of some key functions makes it that much harder. 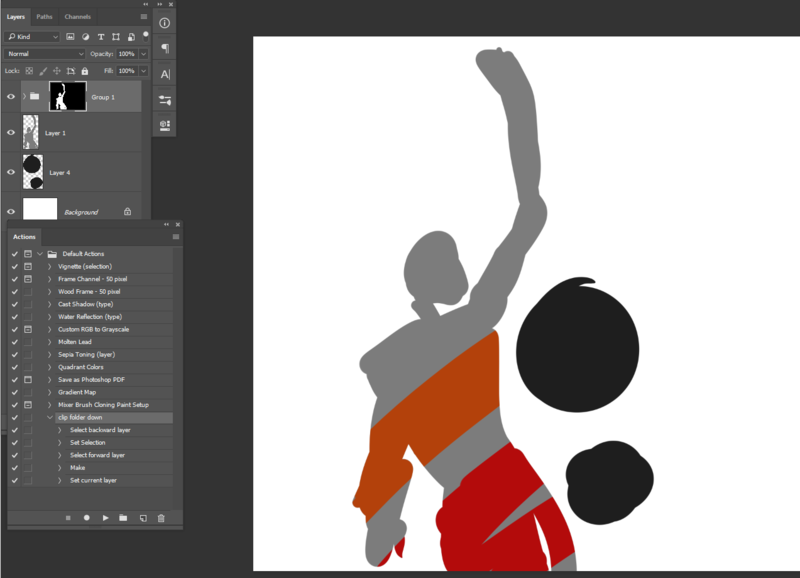 With the improvements made to the vector object transforms (rounded corners that maintain size when transforming, etc) I find I am using shape layers as clipping masks a LOT, but the limitation of not being able to clip a layer-group to an individual shape layer would make that even better. Case in point, I can make a dialog frame using a shape layer and styles. 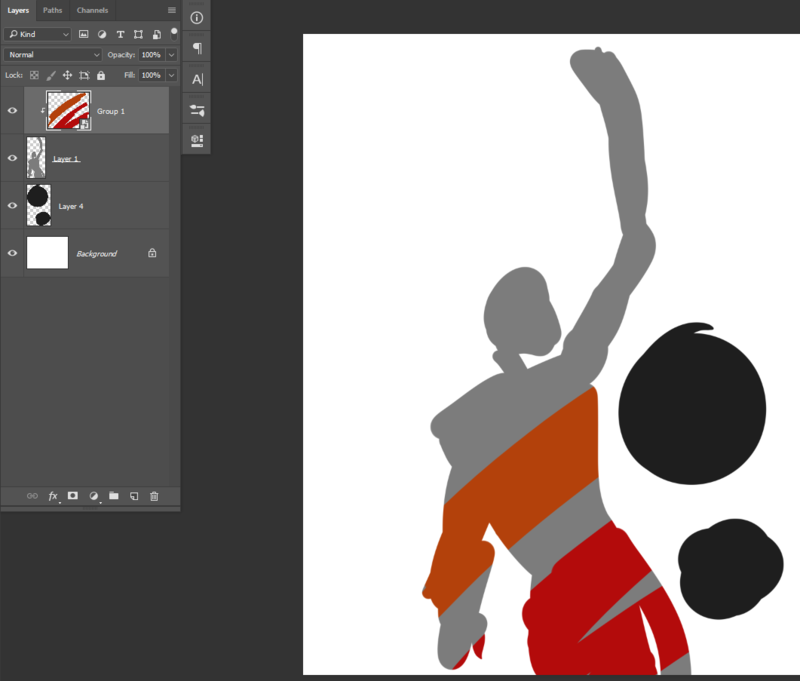 I can then make a layer group with a bunch of background elements and clip it to that same frame shape layer. DONE. As it stands now, I would need to make an alpha or vector mask for the group that would need updating if the frame size changed. Firstly creating the outer text field container with a border radius and then positioning the icon's own square background shape flush left and then clipping that to the field so that it stays inside the border radius. Works fine until I want to organize the icon & the square into its own group. 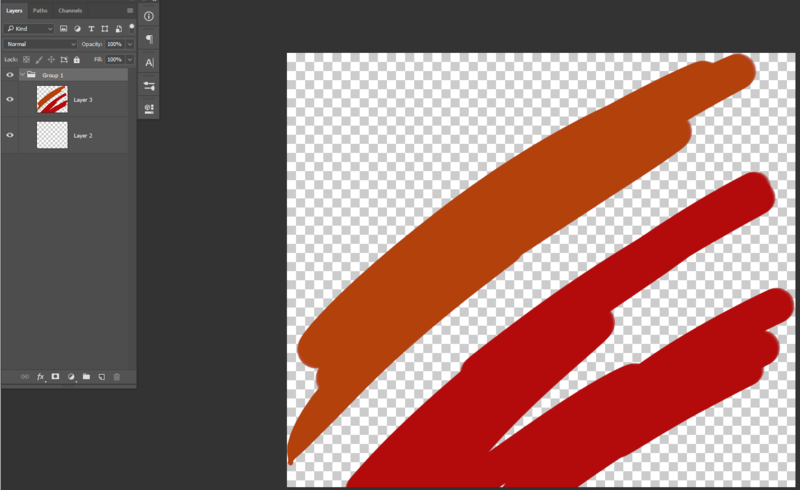 Being able to clip the icon group to the layer below would be useful, instead of having to then put a border radius on the square's top and bottom left. Do we have news on this important topic? It would be really great to be able to apply clipping masks on groups. In other words a group could be clipped by the layer (whatever its type, even if it is another group) below it and on which it is associated. This would be very consistent with the behaviors already existing regarding the clipping masks and would be so much helpful! This reply was created from a merged topic originally titled Photoshop: Clipping mask "group layers" to "single layers". I am still Very surprised this is not a feature yet, to be able to clip a group to the layer underneath it is almost a standard with any other art program. while still being able to edit the layers inside the folder without having to go out of your canvas like you have to when you use a smart object. Simple to use, and VERY handy for when you want to do editing on any of the layers. This is a extremely important feature for Concept artists like me because it allows us to clip color groups onto grayscale value drawings. having the ability to clip a group to the layer below will also create less mess, currently right now i have to clip each layer individually to my greyscale drawing. sometimes between 10-20 layers just floating around. this makes it difficult to add effects because if you break that chain then it wont show anything above it. Please adobe, this is a much needed feature for a LOT of people like me, all the people at my school agree that it should be a feature. I hope that the examples and arguments make it clear of what we want for this clipping feature. there is some need for this so if you would be ever so inclined to take our request into consideration, that would be awesome!!! This would be hugely helpful. The use case I have in mind is for animation when you want to overlay light or shadows on an object. I agree that this would be a huge help. There has been multiple ocassions where I would have loved to have this feature but instead was forced to use clunky workarounds and manually create masks. This works but you lose a lot of flexibility when you want to make changes to the base layer.